Gustaf Aulen attempts in this book to revise the accepted view of the development of doctrine in regards to the Atonement effected by Christ on the Cross. The generally accepted view is that there are basically two types of doctrines of the Atonement: an objective type (e.g. Anselm) wherein Christ's sacrifice satisfies for the sins of the world, and a subjective type (e.g. Abelard) wherein Christ's death on the cross is a demonstration of God's love aimed at persuading men to follow his example (reconcilation of God and a man is effected by the man's conversion in response to the event of the cross). Aulen, however, tries to set a third type of view alongside these two, the view, he maintains, which is common to the New Testament, the Fathers of the Church, and Martin Luther. He calls this the classic view of the Atonement. The three types, as outlined by Aulen, are summarized below, with my conclusions following. A movement of God toward man; continuity in the order of Divine operation, and discontinuity in the order of merit and justice; the Incarnation is seen in close connection to the atonement, as its necessary presupposition; a conflict in God between Love and Justice wherein Love simply triumphs and Justice is left unsatisfied; defies rational systematization. A movement of God toward man, and then man toward God; discontinuity in the order of Divine operation and continuity in the order of merit and justice; the Incarnation is only loosely connected to the work of atonement, because the latter is regarded as done by Christ in the human nature; the conflict in God between mercy and justice is resolved because justice is satisfied leaving mercy free to act; aims at rational explanation. A movement of man to God; reconciliation between God and men is the result of man's conversion / amendment; Christ is merely the great Exemplar; his work may help God to view men in a new light; sin is regarded as little more than an infirmity; salvation is envisaged in worldly terms; that Christ is God at all is almost entirely left out; there is no more conflict at all between love and wrath, for wrath is left out entirely; aims at rational explanation. I dismiss the subjective idea entirely; but I'm not convinced that Aulen has satisfactorily demonstrated sufficient distinctions between the Latin and classic ideas of Atonement to warrant the rewriting of history that he intends here. (Dis-) continuity in the order of divine operation. This is the main distinction that Aulen tries to draw between the Latin and classic ideas of Atonement. However, it is equally present in either case. He makes much of the fact that in the Latin type Christ offers himself on the Cross as man; yet if death and resurrection are the means whereby the devil is overthrown and reconciliaion effect, as the classic idea also holds, then it ought to be indisputable that Christ made atonement as man. For he could hardly have died and risen from the dead as God. In either case, it is equally true that "God was in Christ reconciling the world to himself." In the Latin view as much as in the classic, the atonement is a work of God from first to last, because it is a work executed by the eternal Son in human nature. In fact, while Aulen claims that the close connection between Incarnation and Atonement is brought out more clearly in his view, I submit that the opposite is the case. Anselm's seminal work is entitled Cur Deus Homo. (Why the God-Man?) His great work on the Atonement is actually intended to be first and foremost a work on the Incarnation. In his understanding, wherein a man must offer the satisfaction for sin since man had sinned, yet only a God would offer an infinite satisfaction to atone for the infinite offense of sin, the close connection of Incarnation and Atonement could not be more obvious: the atonement must be effected by one person existing in two natures, divine and human. The Atonement is the completion of the Incarnation as much as the Incarnation is the presupposition of the Atonement. In Aulen's view of the atonement, on the other hand, it is actually hard to see what the place or role of the human nature of Christ is. (Dis-) continuity in the order of merit and justice. What Aulen intends as a critique of the Latin type, I take as its particular merit: namely, that it posits an explanation of the atonement which doesn't involve any injustice. That Love and Justice are in conflict within God Himself, and that Love simply overturns Justice, which must remain unsatisfied, is quite unacceptable. Much better is the Anselmian scenario wherein God's Love is creative enough to find a way for justice to be satisfied other than through penal retribution. God is just in His Mercy, and merciful in His Justice. Reason. Aulen's last critique of the Latin type is that it aims at rational explanation of God's work (Anselm's fides quaerens intellectum), while his view defies rational systematization. Again, I take the opposite position here, viewing rational (not rationalizing) explanation as a good thing, while opining that if something "defies rational systematization" it might just as well be irrational as suprarational. I will confess that I still regard the Latin type, in its Catholic version (i.e. not penal substitution) as the correct doctrine of the atonement (surprise!). In regards to Aulen's work at distinguishing the doctrine of Luther, the Fathers, and the New Testament, from this view, I will say that I cannot speak to Luther's doctrine from a position of real knowledge, so I will leave that be; the doctrine of the Fathers at large is surely not so developed as that of Anselm, but inasmuch as they all agreed in asserting continuity of divine operation, and none denied the continuity of justice, I take them not to hold a distinct doctrine from Anselm, but an underdeveloped version of the same, as is generally taught by the historians of doctrine; the doctrine of the New Testament, of course, I believe to be completely in line with the Anselmian view, even though not articulated in such a systematic way. Is Aulen's view that this "classical" view of redemption was always the Church's true position, or is he admitting it is outside the mainstream but saying that we ought to accept it none the less? I'm not sure if this applies to this book, but I have been seeing the term "Cristus Victor" more and more on various blogs which seek a sort of revisionist history of the Cross. The term/concept itself is quite orthodox (Heb 2:14f), but the 'modern spin' I see is often on Protestant blogs who are horrified by Penal Sub but also thinking they are 'rediscovering the true Biblical teaching' which the rest of us missed. The modern spin for those trying to promote "Cristus Victor" tries to get around any concept of 'satisfaction' entirely, which is quite problematic (eg the term 'propitiation' is explicitly used in Scripture). Boniface: Aulen tries to write as a historian, i.e. without making a claim as to which is the true doctrine. Although the one that he favors is eminently clear. 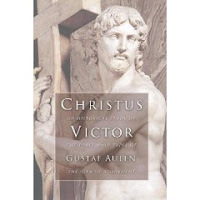 Basically, according to Aulen, "Christus Victor" was the teaching of the NT, the Fathers, and Luther; it was replaced by the Latin view in the Middle Ages, which has dominated Catholic and Protestant theology alike ever since, with the subjective / humanistic view as a minority opposition. He thinks "Christus Victor" to be a great ecumenical opportunity, since it is a doctrine which both Catholics and Protestants have "missed" and thus neither has to adopt the other's position, but both should return to the NT and the Fathers (which is what the Protestants are always trying to do, isn't it?). Aulen was a Lutheran bishop very involved in the ecumenical movement in the early 20th century. Nick: not only does it apply to this book, this is the original. Other views called Christus Victor are usually some kind of spinoff from this one. For example, and quite to the point of your comment, I just finished a book called The Nonviolent Atonement wherein the author promotes something called Narrative Christus Victor as a pacifistic alternative to the traditional satisfaction theories. He, together with the black, feminist, and womanist theologians whose concerns he also tries to address, is totally disgusted with penal substitution (and rightly so), but writes fails to see a distinction between Anselm's satisfaction theory, and Calvin's. I'll post a review on that one soon. Oh, so this modern spin is newer than I thought. I had no idea that book is what started it all. I'm partial to Christus Victor. Pope Emeritus Benedict XVI actually writes against Anselm in his book "Introduction to Christianity". But I was in a conversation with a guy apparently from The Gospel Coalition I was in a forum on Amazon with recently seemed very confused about what it is Anselm and the Catholic Church taught on the issue of the atonement.